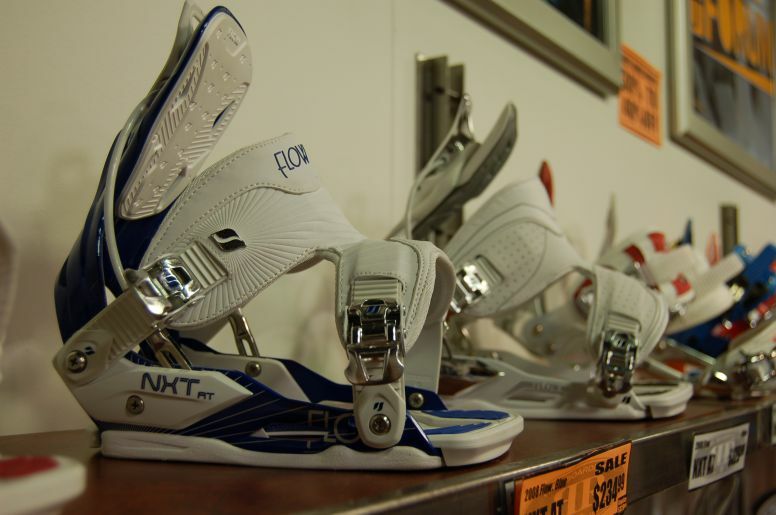 People who rave about Flow bindings always mention how quick and easy they are to put on. For the unaccustomed there seems to be some voodoo going on or at least a considerable amount of lying. The truth is, they are faster to put on but there is a knack that must be learned or you will never make it out of struggle-town. Generally the first mistake that's made is assuming you can put them on easily while sitting down. This doesn't work well at all. All angles are wrong. What you are going to have to learn is jump into them while standing up. This is the secret of the design. The time is saved by not needing to sit down. BTW, technically you don't need to sit down to get into strap bindings - it just tends to be a lot easier. Learning to put your foot into your back binding while staying upright is all about preparation and balance. Preparation because you want to make sure your board is flat to the hill and not going to move anywhere when you lift your back foot. You want to be nice and steady when you lift that anchoring back leg. Balance because even with good preparation you are going to be standing on one leg bound to a board - and it's well known - icy conditions tends to make fools of us all. And besides, when it comes down to it, snowboarding is all about balance. So once the board is steady and you are comfortable to start swinging your leg around you've just got plonk your foot in, flip up the high back and lock yourself in - ready to. Just like it's done in the showroom. It begins to get trickier when you're in steeper terrain and don't feel comfortable balancing on one leg. In these cases you are going to put your front leg in first while standing (if your foot's not in already) and then you have to face the mountain (as opposed to looking down the mountain) and slot your foot in to the binding while on your knees. As you get better and improve your balance you will find you can put your foot in while you are skating away from the lift and you don't even need to stop. This is when Flow bindings are worth the praise because it can make all the difference when hitting first lifts and riding the sweet pow on top of the groomers before the rest of the daily invasion! » Earth: Planet or a Star? Three days in San Francisco and I'm transported back in time to my university days. Apart from socialising and participating in the Beer Olympics, we've been seeing the sites and taking in the San Fran vibe.